Hohenschönhausen (“high beauty houses”) is a neighborhood east of central Berlin. The name of the district is synonymous with the Stasi prison sharing the name, however, and to name one is to name the other. Anna Funder (in Stasiland) tells us that the area around the prison still housed many former Stasi officials as of the time of her writing some twenty years ago, and I wonder if there are many of them left. It wasn’t always a prison district. It was farmland, and then it was a profitable business sector, and then – when the Jewish business owners removed – a Nazi-suppportive war materiel production center. Then it was bombed to hell, along with the rest of Berlin, in five years of bombing runs by the Allies. From ’45 to ’49, it was turned by the occupying force into a Soviet remand prison – the place where suspected Nazis or political dissidents would be housed before they were shipped to gulags or concentration camps at Sachsenhausen (an hour north of Berlin) or Buchenwald (a few hours west and south of Berlin). At the time of Soviet control, prisoners were held in a basement that had formerly housed a canteen – a food center providing prepared meals – and were tortured physically and mentally. Many of the inmates at that time died, as the Soviets had no concern for potential Nazis or opponents of the socialist revolution. It was run by the Russian State Security Service (NKVD). After the founding of the DDR, the Soviets let control pass to the new country’s State Security Service (modeled after the Russian predecessor), the Stadtsicherheit, or Stasi for short. The agency built a proper prison facility in a new, u-shaped building around the old prison grounds. 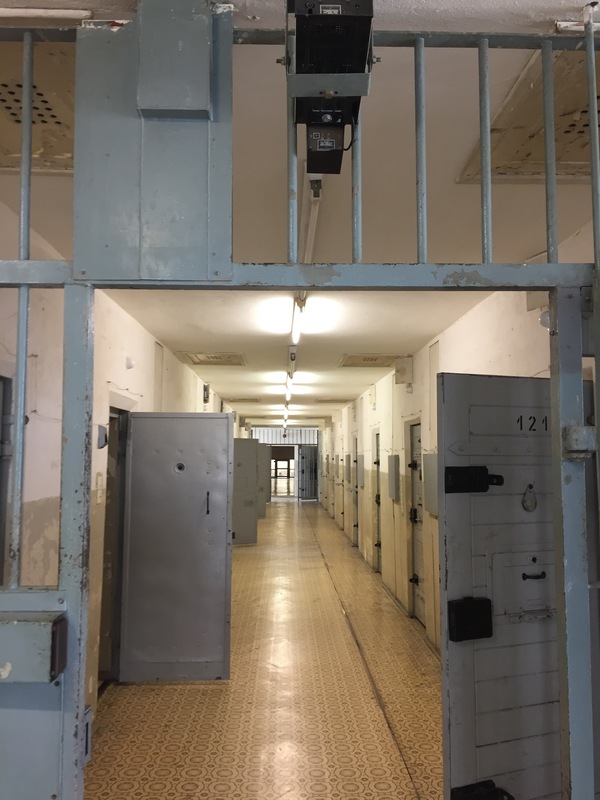 This facility was operated as a Stasi remand prison until 1990, taking in tens of thousands of arrested political dissidents or mere citizens who happened to disagree or utter the wrong joke on the wrong occasion. Investigations were carried out while suspects awaited sentencing or release; the average stay was about six months. One of its last inmates was Erik Mielke, the longtime chief of the Ministry known as Stasi, as the state devoured itself. It feels like a scary place. The Soviet basement-prison in particular is horrid, even today. In one of the water torture rooms, the person-of-interest would be forced to stand in the center of a room about 4’x6’ in size, and ice-water would be poured in until he or she would be standing in about 8”-10” of freezing ice water. They would be ordered to stand there for hours. In the blinding darkness. Showers would come every two to three weeks, and changes of clothes were about as rare. Sometimes four or six people would share a cell 8’x10’, and their toilet-bucket had no cover. There were no windows in these basement-level holding rooms. The walls turned black from moisture-bred mold. The Stasi prison was lovely by comparison, but it featured its own brand of awfulness, identical to that of which I learned at the Dresden facility two years ago. Isolation is the watchword for Stasi prisons. You’re taken off the street and put into a van with a tiny compartment for you alone. You’re taken out upon arrival in a garage, where you’re told to strip and are searched thoroughly before donning your new prison garb. Everything is done by careful orders, sometimes only to make the point that the orders are now the most important thing in your life. Your eyes should always be on the floor – never directed at any guard. You’re marched down an empty hallway. As you are moved from one hallway to the next, red bulbs are flipped on over doors you are approaching, so that if another prisoner is being moved, the guards with that prisoner know to follow the procedure for keeping you from any eye contact or communication with the prisoner marching the other direction. You’re in a cell with a wooden-planked bed topped with a slight mattress and are told the rules for the cell. You are not to sleep during the day. If you sit, you must sit straight-backed. You must not hide in your cell from the line-of-sight from the 15”x4” panel that opens every fifteen minutes on the door for an observer to note whether or not you’re following the rules. No exercise of any kind is permitted while you’re in the cell, but you’re taken outside alone for thirty minutes of forced, clockwise (and then counterclockwise) circles of marching exercise. You’ll be observed by guards with guns – the only guns in the facility that you would ever see, if you were permitted to look upward from the ground at your feet to notice them. The guards stand on gangways above your concrete pen. Then you are taken back to your cell, again without seeing anyone else. You will never see the world outside the prison, as your windows are thick, opaque, glass blocks. Your name while you’re incarcerated at this prison is your cell number. You may speak with someone only when you are removed from your cell for interrogations that can run 12 or more hours in duration about once per week. Your interrogators have studied at the Potsdam Stasi Law College, where they studied how to break you – the Stasi produced reams of academic papers on how best to achieve this goal, and some of the DDR’s best science was focused on psychological torture and interrogation techniques. Generally, the Stasi did not invent evidence from whole cloth. They were, in fact, in search of the truth. But what was considered a crime might be, for instance, that you have contact with someone in the West and failed to report your most recent conversation with the Stasi. Are you planning an escape attempt? Are you fully supportive of the socialist revolution? It’s much better if you talk, though they already have all of the evidence they need (from clandestine home invasions) to convict you, so really it’s a matter not of whether you’ll be convicted but how long your sentence will be… will it be for seven years? Fifteen? A life sentence? If you do not cooperate, say, by providing some helpful information about your neighbor, you might find yourself sentenced to a life term. The lights in your cell are turned on every fifteen minutes through the nights, just to ensure you’re in the proper sleeping position – on your back and hands above the sheet (they don’t want you attempting suicide). If you’re any longer than the 2.65m length of the bed, you’ll just have to do the best you can with your feet pressed against the wall in front of you. Good luck. Correction: thanks to a comment (below), I am reminded that the beds in the basement prison – not the newer prison – were 1.65m in length (not the 2.5m I misreported about the new prison’s facilities). The other rules for sleeping still hold. Also, I am remembering this interesting tidbit: there was not one escape between stasi taking control of the prison and the end of its service to the DDR. 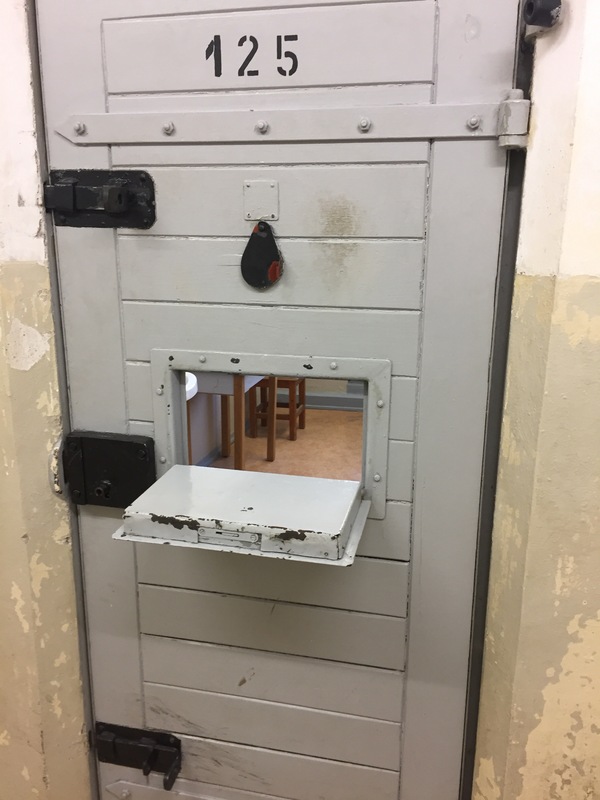 Read about my visit to the Dresden Stasi prison here. Tips for your non-incarceration visit to the memorial: check the tour times in advance of your trip to the prison; you’re not permitted (the sign in the yard told me this, anyhow) to wander the prison on your own, so you’ll need to be with the tour to see the inside of the prison; tours are offered in German or in English. This is not the case at the Dresden facility, where you can wander the eerily silent halls and cells alone. Fees are nominal, in both locations (expect around a 5-euro entrance fee at the memorial in Dresden (there is no english guide, audio or otherwise, there) and a 6-euro fee for the tour in Hohenschönhausen – fees support the memorial directly). On your way in or out of the prison, on the street between the tram and the entry point, there’s a little currywurst shop called “kittchen imbiss” – you should eat there, but beware the woman running the joint – when I asked her to repeat the price of my food, she barked at me like a commandant at an inmate – my only experience of a German being angry with me for not understanding. Don’t bother with this place if you don’t speak a lick of German. I suspect she’ll shoot you if you speak any English. References/Sources include the aforementioned Stasiland, a personal visit to and tour of the prison (and so to the tour leaders there), and The Prohibited District: The Stasi Restricted Area Berlin Hohenschönhausen – also relevant is the Dresden facility. This entry was posted in Travelogue, Travelogue 2017, Travels and tagged backpacking, Berlin, Culture, europe, european travel, exploring, History, hohenschönhausen, learning, prison visit, Slow Travel, Stasi, stasi prison, tips for travel, travel, traveling. Bookmark the permalink. The forced sleeping positions intrigued me. Were there many inmates more than 2.65m, do you think? Haha, oops! 1.65. I’m not always so good with metric heights! Thanks! In that case, I would have had difficulties. I’m taller than that, I sleep on my side, and my hands are under the covers. Also, this probably requires revision thank you for making me notice it. The short beds were in the “u-boat” basement prison and not in the main prison.